Actually, my office looks pretty good in comparison. The books above my desk are fairly well organized but I seldom use them. 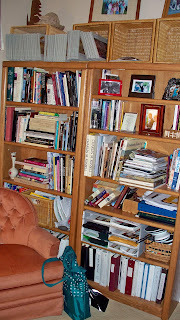 The other bookcase indicates regular use of my art research books. With the deliverance next week of the nine boxes of my new book, I’ll have little space left to navigate the small room. Where will I store them? That said, I know some authors whose offices resemble Buckley’s. Like him, they are intelligent, excellent writers. 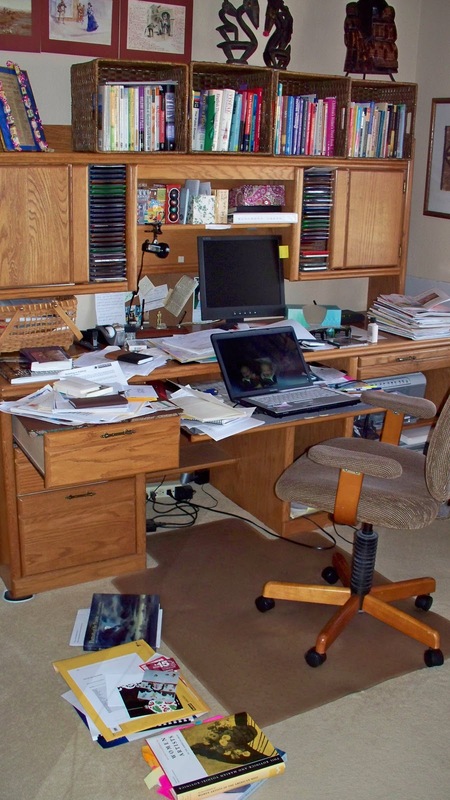 After reading Kathryn Lay’s book, The Organized Writer is a Selling Writer, I realized she did not refer to messy offices but, instead, she emphasized setting goals, keeping records, and writing regularly. I know how important records are and so should you. Whatever your method of recording ideas, submissions, markets, and more, do a thorough job. It saves time later. For example, I received a phone call from an editor who wanted to use a submission. I didn’t recognize the article name she mentioned. So, she read a few words. Then, I remembered that since submission, I’d changed the name. Another call indicated a desire to print a 300 word desk calendar piece I’d submitted two years ago. Once I checked my spreadsheet, I located the article. That brings up another organizational point. When you record your submissions, have a column that tells where the article is stored on your computer. I can’t tell you how many articles I’ve lost because I don’t remember where I saved them. Sometimes even a search fails to find them. A certain amount of organization is necessary for a writer. Have you sold “all rights?” Did you send it snail mail or email? The most important record is a bibliography for non-fiction as well as fiction writers. Nothing hurts more than an editor wanting to know where you acquired a certain bit of information and you can’t find it. Don’t organize your office; organize your records. 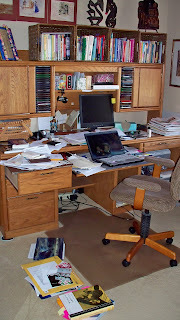 Sage advice...I'm halfway there...and the writing area is fairly organized as well. Good for you, Dean. As you can see, I'm not there!